Affordable housing and housing finance solutions are imperative to the economic growth agenda across Africa, not to mention dealing with the obvious housing backlogs. In this, the private sector is a critical player in moving the agenda forward and innovating to increase access to affordable housing finance solutions. The key term is “affordable”. The graph below shows the rural urban split of households by income category for the African continent – just an estimate, indicative of distribution. Different income categories have different levels of affordability. By looking at populations in this way, one can understand the level of opportunity available in the different income categories (note that detailed affordability graphs are available per country). This makes it possible to see where the need lies and come up with innovative ways of responding. Annual household incomes across Africa are generally low. Only a very small percentage of households earn above $600 a month or $20 per day, even in urban areas. The graph below illustrates the average annual household income and the housing affordability for a range of countries in Africa. This is based on an annual survey carried out by The Centre for Affordable Housing Finance in Africa and data obtained from C-GIDD, 2014. 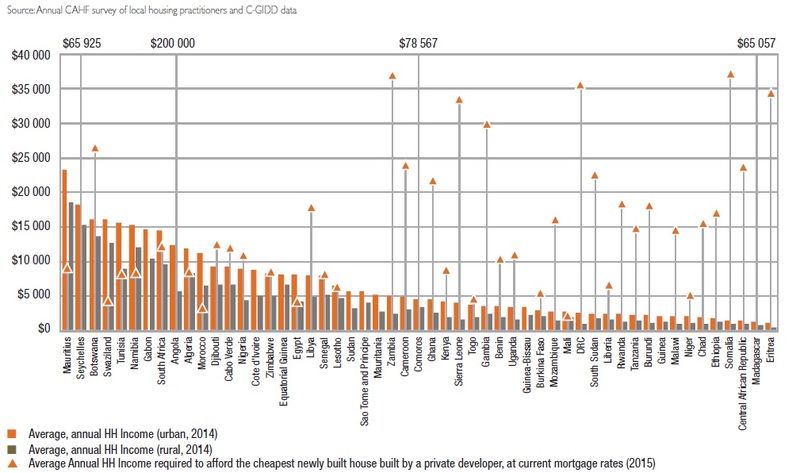 This graph illustrates the gap in affordability, given the current prices of new-build housing, and highlight the opportunity to provide innovative solutions to African markets to meet latent demand. The housing affordability story is significantly influenced by the price of building materials, and this is an issue that CAHF is exploring with its partners in the coming year. Key among these is the price of cement. If it takes 35-40 bags of cement for the construction of a 40m2 brick and mortar house, the per bag cost is a critical factor. In 2015, the most expensive country with respect to cement, at US$30,30 for a 50kg bag, was the DRC, followed closely by South Sudan, where the same bag cost US$29,00. Compare this with Nigeria (US$11,00), Kenya (US$7,60), and Senegal (US$5,06), and the cheapest source of cement, Tunisia (US$3,53), and the capacity of a household to build their home with cement becomes somewhat more clear. 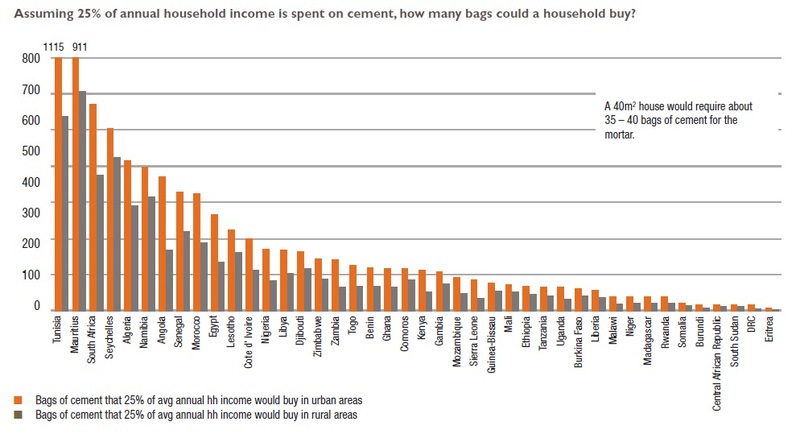 The graph below shows the number of 50kg bags of cement that a household might be able to buy, if they spent a quarter of their annual income just on cement (a generous assumption), based on the current price of cement in their country. Given these challenges, opportunities for innovative building materials that reduce the burden of cement, have become niches that investors are exploring. At the same time, cement manufacturers themselves are also exploring new niches in this space – Lafarge Malawi, for example, has launched a new cement binder specially formulated for use in soil stabilised bricks. The process uses much less cement, which means that low income households who might otherwise have foregone the use of cement entirely, can now afford to use it to improve the durability of their homes. Lafarge argues that the houses built with this technology can be 20-40 percent cheaper than houses constructed with conventional material. Meanwhile, Lafarge Malawi has found itself a market that was previously excluded from buying its product. This is also available in Rwanda and will be launched in four more countries (Cameroon, Tanzania, Kenya and Zambia) in 2015. A complete offer is provided, including training, access to equipment and technical assistance in preparing the right mix of constituents and brick compression. LafargeHolcim is a private sector player which has a growing footprint in Africa. The affordable housing sector has been identified by LafargeHolcim as one of the growth levers for the company moving forward and has a footprint in Kenya, Morocco, Nigeria, Cameroon, South Africa, Zimbabwe, Zambia, Malawi, Tanzania, Uganda/Rwanda focussing on microfinance, earth and cement as well as mass housing. This indicates that the private sector is fast realising the importance and potential of affordable housing in Africa. LafargeHolcim partners with local microfinance banks, provides technical assistance, directly to home builders (architectural drawings, bill of quantities), and link these stakeholders to a network of retailers. With regard to Earth & Cement Solutions, the need for an alternative complete solution to burnt clay brick buildings was identified by LafargeHolcim. Compressed Stabilized Earth Bricks (CSEB) for which LafargeHolcim R&D reinvented the mix design. This is sold as part of a full offer including the bricks, the machines to produce them, the training on mix design, as well as the design of the entire house. Regarding affordable and social housing, LafargeHolcim prescribes value added construction systems to developers in projects’ early phase. LafargeHolcim as a private sector player recognises the importance of partnerships with the public sector, NGOs etc. and has demonstrated that through such initiatives with organisations such as the French Development Agency (AFD), tangible mass housing projects can be delivered. An example was a project of 900 units in Nigeria in 2014. In addition, the Affordable Housing Hub is a LafargeHolcim joint initiative created with its partners, UN-Habitat, Agence Française de Développement, Inter-American Development Bank, World Urban Campaign, and Inclusive Business Action Network to develop a knowledge sharing platform for the field of affordable housing. The Affordable Housing Hub Hosts a wealth of information in the form of case studies, blogs etc. of various initiatives in the affordable housing field. Of particular interest are the housing microfinance business models that are identified in Africa and in other parts of the world. Examples of initiatives found on the website are; Ghana Home Loans using finance model tailored to Ghana’s market, co-operative housing in Senegal and Mali, World Bank solutions in Egypt, Morocco’s ‘Cities without Slums’ programme etc. LafargeHolcim is just one example of the private sector providing solutions for affordable housing development and creating partnerships within the sector. The Affordable Housing Hub provides a very informative platform to grow and share knowledge through webinars etc. about affordable housing initiatives around the world.